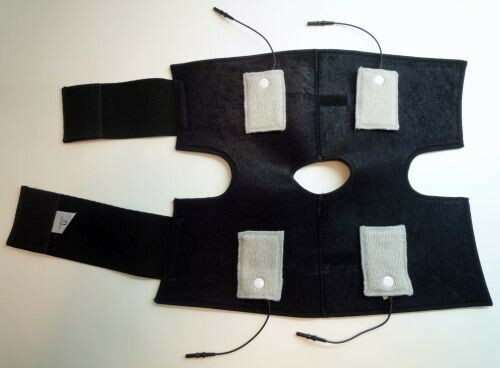 Knee Brace w/ Fabric Electrodes is a BioMedical Life Systems garment woven from conductive fabric that replaces traditional adhesive electrodes when used in conjunction with an electrical stimulation device such as a TENS or HVPS device. 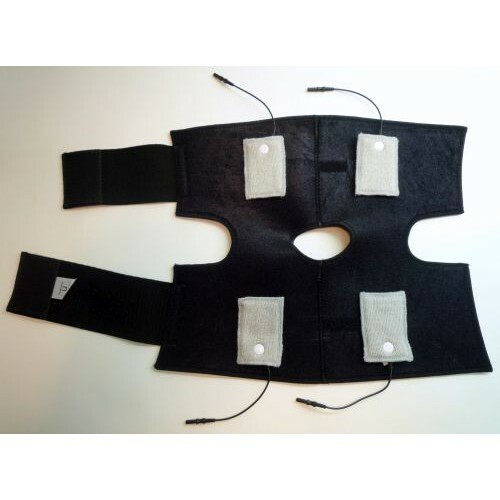 The conductive fabric panels attach with Velcro and can be moved or positioned depending upon the patient's needs. Knee Brace w/ Fabric Electrodes are woven with silver threadto provide balanced stimulation to the entire covered area. This BioMedical Life Systems knee brace does not require adhesive or tape for application. Specifically indicated for patients suffering from ACL injuries, arthritis, sprains and other painful knee conditions, this knee brace with electrodes is a great alternative for patients with skin that is too sensitive for traditional electrodes. You might also be interested in similar BioMedical Life Systems items and products, such as BioDerm Carbon Electrodes. Conductive fabric properties of the BioKnit conductive garments and pads take the place of traditional adhesive electrodes. Panels are woven with silver thread to provide even stimulation to the entire covered area. Indicated for patients suffering from ACL injuries, arthritis, sprains and other painful knee conditions. Great alternative for patients with skin too sensitive for traditional electrodes. Sold in each quantities and can be used on either the right or left knee. Device and conductivity spray sold separately.